In two transactions between the same two parties, Fairfield Residential has sold two apartment complexes in Everett with 443 units for $105 million to Mill Creek Residential Trust. A local investor purchased two Lake City fourplexes in 2005 for $1 million. Now the owner is proposing to redevelop the site at 12729 30th Ave. N.E. with a seven-story apartment building. North Seattle foodies have long treasured the out-of-the way Toyoda Sushi, at 12543 Lake City Way N.E. The Toyoda clan owns its small, skinny midblock property, with 6,505 square feet, which it purchased in 1990 for all of $159,000. A small old auto garage property at 5326 Roosevelt Way N.E. sold this month for a little over $1.2 million. Now there's a plan to redevelop the site with a four-story apartment building. The Oberto store property at 1715 Rainier Ave. S. has sold for just over $4.1 million, according to King County records. 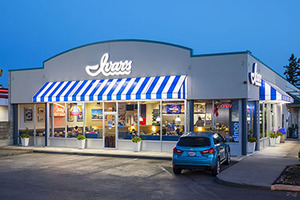 Ivar’s locations in Burien, Issaquah, Renton and Kent have received an updated look and significant renovations.